You read that right: this is a Audi RS6 SEDAN! What happens when a carmaker stops making your favorite car? If your Roni Collin, you make it yourself. Introducing the world’s only C7-generation Audi RS6 sedan. 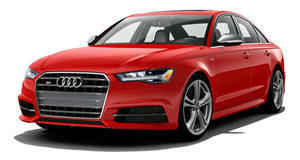 The two previous generations of the Audi RS6 (C5 and C6) were available as four-door sedans, but the latest model came exclusively as a wagon or ‘Avant’ in Audi speak. To create his perfect car, Collin took a standard Audi S6, and added a wild widebody kit. He then completely reworked the suspension and upgraded the 4.0-liter twin-turbo V8 to 580 hp and 656 lb-ft of torque (a stock RS6 has 597 hp and 553 lb-ft of torque). With a full Milltek decat exhaust system, a set of 20-inch Rotiform HUR alloys, and finished in Audi’s original Mochalatte body color (the S6 was originally black), the result is stunning. And with a 3.7-second 0-62 mph time and 0-125 mph time of 11.9 seconds, it has performance to match. Hat tip to Nathan from State Side Supercars, who shot this video of the car revving at Worthersee 2016.